A stunningly lightweight alpine-style jacket, the Rab Men's Spark Jacket protects you from the worst weather, but takes up next to no space in your pack. Ideal for active use in all weathers, the Spark is constructed from Pertex Shield+, a waterproof and breathable fabric from the legendary Pertex stable. No stranger to the world of high performance lightweight fabrics, Pertex have taken things a step further by engineering Shield+ with stretch. 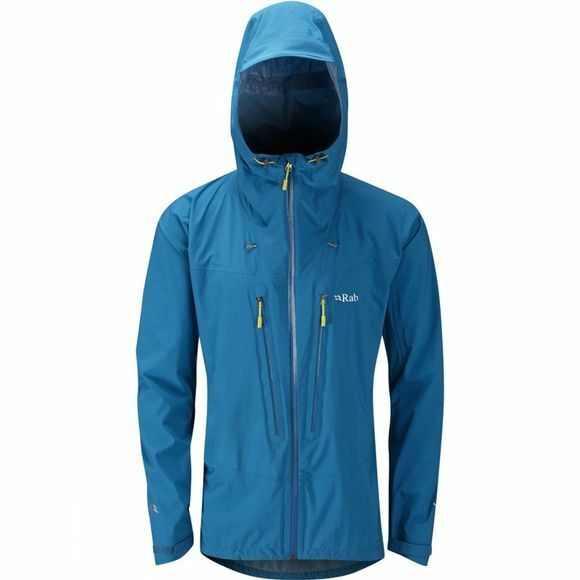 Rab then combined this stretch with a free moving cut, to make this jacket perfect for the needs of the Alpinist - as well as for the needs of anybody who wants to enjoy unrestricted movement! Also catering for the mountain enthusiast is the helmet-compatible hood, while the generously sized pockets are positioned to be accessible when you're clad in a harness, as well as being mesh lined to function as vents. All this in a jacket which weighs less than half a pint of water!